Use the sage old owl to add a touch of sophistication to your décor. Using the template cut the owl body. Flip template over and cut a second owl body. 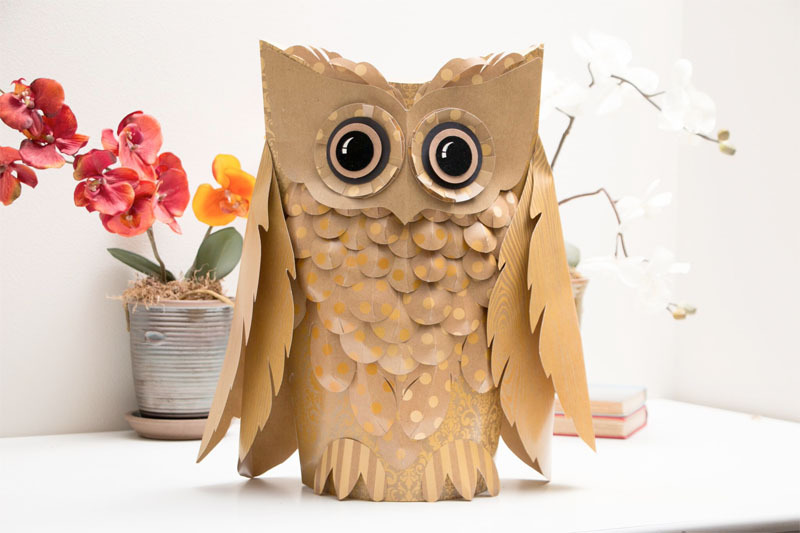 Score and fold both owl body pieces using the dotted lines on the template as a guide. Adhere body pieces together on the flap. Cut owl face using template pieces. Score and fold the owl face using the dotted line shown on the template as a guide. Adhere face to the body using dimensional foam squares. Using the template cut the owl eyes. Layer the circles together and adhere them to the owl face. Using the template cut four wing pieces. Score and fold the wings using the dotted lines on the template as a guide. Adhere wings to the owl body as shown. Using the template cut 2 owl feet. Round the feet around the end of a pencil and adhere them to the owl body. Using the template cut feathers in the following quantities: 20 small circles,14 large circles, 4 small feathers facing left, and 5 small feathers facing right (just flip the template over to change directions). Score and fold each feather on the dotted line. Slide one side of the slit over the other side and adhere them in place. Adhere feathers to owl body beginning with the small circles under the owl face, then the large circles, and finally the small feathers. Using the template cut eyebrow feathers (cut one set one way and then flip, trace, and cut the other side facing the other way). Adhere feathers to owl body tucking them behind the owl face as shown. Add more feathers (or take some away) as desired. Try using solid colors for the different components and see how bright the owl becomes! Adjust the size of the template pieces (i.e. enlarge or reduce) to get a family of owls!